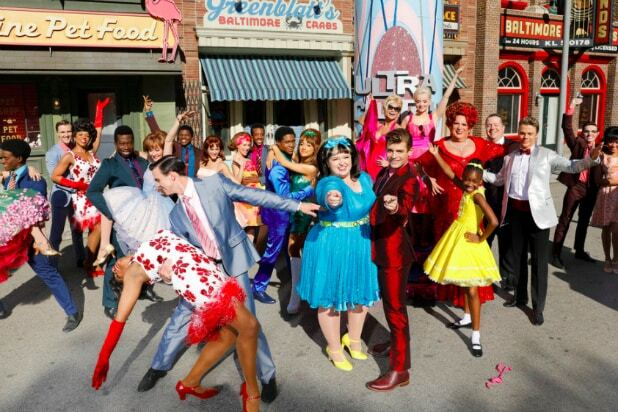 The production also stars Harvey Fierstein, who will re-create his iconic Tony Award-winning role as Edna; Oscar, Golden Globe winner Jennifer Hudson as Maybelle; Emmy and Tony Award winner Kristin Chenoweth as Velma Von Tussle; Ariana Grande as best friend Penny Pingleton; Tony and Emmy winner Martin Short as Tracy’s father, Wilbur; and Emmy winner Derek Hough as Collins. Craig Zadan and Neil Meron serve as executive producers. Fierstein wrote a new teleplay and Tony winner Jerry Mitchell serves as choreographer for the live production with music and lyrics by Tony winners Marc Shaiman and Scott Wittman. The 2002 musical, based on John Waters‘ 1988 (nonmusical) movie, returned to the big screen as a 2007 musical feature starring Nikki Blonsky, John Travolta, Christopher Walken and Zac Efron. 8:00 p.m. ET: And we start with a pan down to a homeless lady. Early commentary on pre-Trump America? 8:03: Those are some of the cheapest-looking mice crossing the streets of Baltimore — and then Tracy encounters a flasher who’s clearly wearing shorts. 8:05: And here’s Derek Hough as Corny Collins, the host of the “American Bandstand”-like TV show. 8:10: Is it possible Garrett Clayton (as teen hearthrob Link Larkin) looks older than Derek Hough? 8:11: Martin Short is doing Martin Short as Tracy’s dad. And he also pulls a clearly labeled Coca-Cola from the fridge. Product placement alert! 8:15: Ariana Grande has gone all Clark Kent with her mousy look — but she has some pipes if she eventually gets to sing. 8:19: Former “Glee” star Darren Criss pops up to say, “I guess I’m hosting.” Did no one tell you in advance, Darren? 8:24: Garrett Clayton seems to be stuck in a one-man Mannequin Challenge in this number, poor guy. 8:30: Disney star Dove Cameron is well cast as Kristin Chenoweth‘s daughter. Same cheekbones. 8:33: Kristin can belt, she can twirl a baton and she can play evil racist ice queen. But not sure she can inject enough life into this production. 8:34 A custom, just-for-this-show on-set commercial for Reddi-Whip, which “back in the day” was delivered by milkmen. Nice touch. 8:38: Rosie O’Donnell looks notably svelte — as she sends poor Tracy to detention. 8:45: And then Derek Hough doesn’t miss a beat to segue into a “period” live commercial for Oreo cookies. This is a smart idea, and fits the ’60s TV show setting. 8:47: On the whole, though, I’d rather be in Paris with Julia Roberts — even if it’s Lancome’s version of the City of Light. 8:49: A TV ad for “Wicked,” the show that really made Kristin Chenoweth. But why no singing in the ad and just that clunky voiceover? 8:51: “Imagine, my little girl, regular.” No one does deadpan quite like Harvey Fierstein. 8:52: “Someday I hope to be the first female president,” Tracy says. But Amber’s “Ha” suddenly has an added resonance after Hillary Clinton’s defeat. 9:00 A “Rogue One” ad? Disney apparently thinks that there’s some overlap between the fan base of musical theater and “Star Wars.” That might be the night’s boldest move — and it doesn’t involve choreography. 9:05: Tracy and her mom are on the move to the open-air studio lot. Expect lots of tracking shots for the next few minutes. 9:08: The last two Pinkettes to flank our Tracy are the original Tracys, Rikki Lake from the John Waters movie and Marissa Jane Winokur from the original Broadway production. Nikki Blonsky, call your agent. 9:11: With all the quick costume changes, this is definitely the best group production number so far. But the others have been pretty disappointing. 9:24: And now we get another outdoor dance break so that the leads can move themselves to a new set, from the high school gym to Motor Mouth Records run by Seaweed’s mom. This number is not popping as it should — despite Ephraim’s leaping split. And what’s up with Ariana Grande as bubblegum-popping, quick-to-swoon Penny? 9:30: And here’s Jennifer Hudson in a bizarro blonde wig and doing an equally bizarro accent for some reason. 9:32: Weren’t Link and Tracy just in the high school gym? When did Link manage to change from shorts into jeans and a jacket? 9:36: “It’s just that boys are not the brightest things.” Preach, Edna. 9:38: Jennifer Hudson sure can belt, but she doesn’t have nearly enough “weight to throw around” anymore to really sell this number as a “big” girl like Edna. Maybe Weight Watchers makes pecan pie? Or she wandered over to Broadway’s “Waitress” musical? 9:42: So an anthem against fat-shaming (“Big, Blonde and Beautiful”) suddenly morphs into a race riot with Tracy — and Tracy alone — getting hauled off to the pokey. Huh? If you’ve never seen the show before, you can be forgiven for being seriously confused right now. 9:44: A well-timed commercial for “La La Land” — an original and delightful new movie musical starring Ryan Gosling and Emma Stone that’s emerged as an Oscar favorite. I love this movie — and look out for the opening scene/song, which seems to be shot all in one incredible take. 9:51: Harvey and Martin seem like old pros in their duet — a number that includes another timely reference (to the just-passed Fidel Castro). 9:56: Watching Martin Short do song and dance, I can never shake the image of him as Ed Grimley. 9:57: That said, this number always struck me as filler. This show is about the kids — and the fight for the future. All the scenes with Tracy’s parents recalled those early-season “Beverly Hills 90210” subplots with Brenda and Brandon’s folks. Get back to the stuff we care about! 10:02: The TT+LL graffito in the prison cell is a nice touch — but the production is doing Maddie no favors by shooting her at a distance through prison bars. 10:05: “Without Love” is one of my favorite numbers in this show — but why are they shooting is so we see the back of Maddie’s head and only half of Garrett’s face? Or vice versa? And even when we can see them, they’re half in shadow. 10:08: The best part of that number may have been the “Dangerous Woman” joke Darren Criss just made about Ariana Grande. The cuts were so jumpy, the lighting so off, the dancing so unspectacular. 10:17: Billy Eichner cameos as a black-and-white newscaster. Will he show up on the streets of Baltimore yelling at people and asking random questions? 10:18: A rain effect outside Motor Mouth’s record shop — that explains why the outdoor set had puddles earlier despite the fact that there’s been no rain in L.A. all week. Plus, she gets one of the show’s best (and once again most prescient) lines. 10:29: Another period commercial — this one entirely fictional. And the rare title song in musical theater that really has nothing to do with the plot. 10:31: Yet another awkwardly staged book scene (and this evening is full of them): This time, Kristin Chenoweth actually shuts up the giant hairspray can that her character says she desperately wants to open. Oops. There’s live television for you. 10:32: And Jennifer Hudson makes an awkward reveal that she’s disguised as a cop. 10:34: And now we get to the closing number — which should be epic because they have 25 minutes to go. 10:35: Ariana Grande‘s white go-go boots may not be 1962 but they look pretty hot. “I’m a pretty girl, mama!” Indeed. 10:39: A full scholarship to Essex Community College!?! 10:42: JHud sheds her cop uniform for a glittery gold number that foreshadows all the glittery gold stuff she looking to get at next year’s Emmys. 10:50: And because they wrapped up not just on time but early, JHud and Ariana Grande treat us to a bonus holiday duet. 10:52: I don’t remember full-fledged curtain calls in NBC’s previous live staged musicals. 10:55: Is this a first for live TV? The production ended early. And the 11 p.m. news starts… before 11 p.m. I guess that proves the beat really can be stopped — a fitting lesson after a fun but seriously uneven live production.